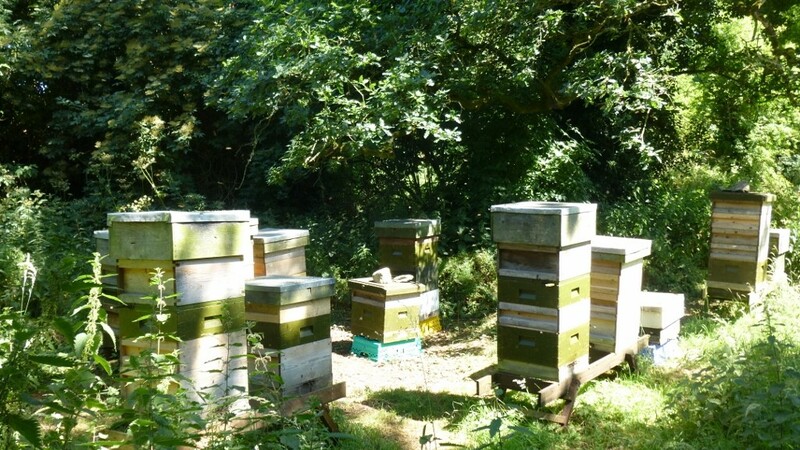 Choosing which type of hive to use is like getting married – get it right from the start and stick to it; if you go messing about later, it will come back to bite you and you’ll regret it. Not all hive parts are interchangeable and you’ll end up in a right mucking fuddle. In this country the two main types of hive in use are the National and the Commercial. National hives are slightly smaller and much lighter to handle but they are more difficult to build. The construction of the hives means they have a very good handhold to lift them with and the frames have a long lug which makes them easy to grip. The recessed wall on two sides also means they are almost a double wall hive if you use a deep roof in the winter. Two of the hives in the photo above have deep roofs. This photo was taken midsummer (obviously) so they have been split over Snelgrove boards and supered but you can imagine how far down the brood box such a roof comes and the insulation it provides to the sides of the brood box when the supers are off. The small size makes the National hive the better bet for the Native Irish bee. If you were to use a Commercial hive with these bees you could end up with all the honey in the brood chamber. Commercials are big hives. The name somehow suggests you’ll get more honey – not the case, in bad year the bees will put all the honey in the brood chamber. They are a very heavy hive when full but they are easy to make. They have very small handholds which are difficult to grip so you end up having to twist the hive and grab it from underneath. The frames also have very small lugs to you need the grip of a rock-climber to haul a full frame up and out. Which is the best hive for this climate is a debate for the pub. It is possible to operate using National brood boxes and Commercial supers – that way you have the best of both worlds but it would be inadvisable to have both National and Commercial brood boxes on the go – sooner or later that becomes a nuisance. 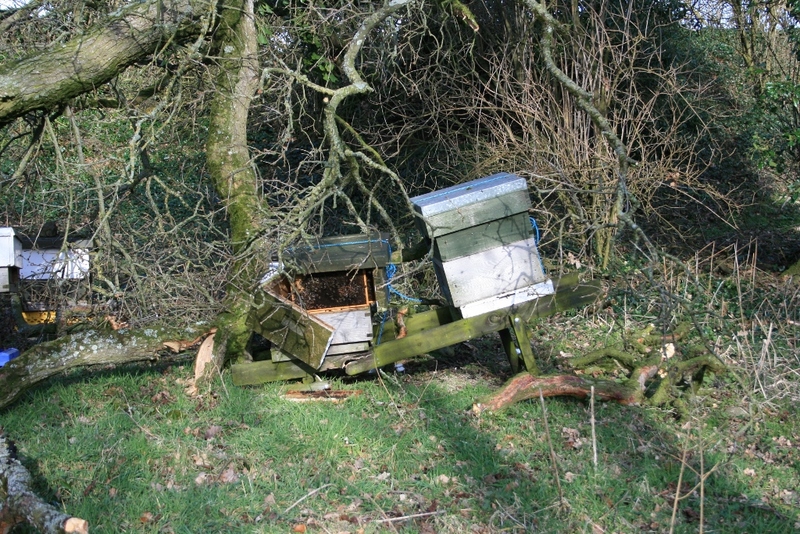 Hives are available new or second-hand or can be made relatively easily and cheaply by all but the accident-prone or manually inept but be aware of the beespace. New hives are more expensive but they come disease-free and with a longer life-expectancy. Old hives are cheaper but, again, the beekeeper should be aware that disease could be lurking in old hives. A pertinent question to ask the seller would be – what happened to the bees? It is recommended to flame the interior of old hives with a blow lamp as a way of sterilising but some diseases, such as American Foul Brood (AFB), have tough resistant spores which can survive for up to 40 years and could be tucked out of reach in tiny crevices. If such was the case then these spores could germinate and infect your lovely new bees at a later date. This would be more the case with brood boxes but second hand supers would hold less risk. For brood diseases anyway. If you do decide to go for second hand boxes, make sure you check they are waterproof and bee and wasp proof. As hives age they tend to give out at the joints and small gaps appear. The metal sheeting of roofs can split at the corners or be otherwise ruptured. If you are good with wood it is a good idea to buy a good, brand-new, flat-packed hive. That way you will know what the best looks like, you can copy it and the dimensions will be correct. Hives are available in cedar, deal or plywood. Cedar is durable so hives are indestructible by the weather and need not be treated. Deal is cheaper but unlike cedar it is not durable and hives need to be treated with a wood preservative (one without insecticide) or painted. Plywood is the cheapest but my advice would be – avoid it. Marine ply is extremely heavy. The other stuff will very quickly succumb to the climate how ever carefully you paint it. I bought a few of these. I found them relatively cheap. They came flat packed but slotted together very easily and didn’t need to be glued or anything. You don’t have to paint polyhives but they will last longer if you do. Look closely, the polystyrene consists of lots of little balls all pressed together. If you don’t seal the surface, a thin film of water can get betwixt and between and if it freezes – the ice expands and weathering can begin. I used one coat of gloss – no undercoat – is fine has lasted for at least 5 years now. You can see some of them in use in the header picture – the green boxes. Flat packed but slot together very easily with no need to glue or nail. That’s not so silly as it sounds – they are very dense and will take a nail so long as you don’t ask much of it. Lovely and warm for overwintering or drawing wax and heathering. Great for supers where little manipulation is required. Granted, this poly box took the brunt of this fallen branch but the front wall just popped out and the whole thing was a write off. If you drop them and they land wrong they’ll just burst! Cannot be scorched to sterilise eg AFB etc. Instead, you need to scrape clean then scrub with a strong household soda solution then sterlise with bleach. They won’t take much scraping, there are weak places which show wear quite quickly. Not great for manipulation – the frame lugs sit flush and get propolised so less good as brood boxes. There is a new generation of polystyrene hives now which do have a rail which is good but they are less robust than the previous type. The Varroa floors are not great – having a rather small mesh area but you could always use a timber one. I would buy more polystyrene supers but I prefer wooden brood boxes. A word of warning – whichever hive you buy – don’t go knocking up all those frames before you need to or the foundation will go all hard and the bees won’t draw it properly.